As their teeth begin to grow, children find their way into trouble way too often than before. They begin to bite, chew and rip off anything and everything that comes their way. The worst part is, they will nibble on anything and almost everything that stands in their way. The first and foremost step to overcome this problem is to understand what is causing it. Acknowledging the fact that children are biting whether it is nail biting or hair biting can be one way of looking at the problem. However, at this stage you have done nothing but merely understood that your child bites. A more important measure would be to examine the causes to such behavior. Toddlers bite on almost everything once they reach their teeth growing age. Children bite their nails and hair as a form of letting out aggression or anxiety. All these could be negated if their problems are not overlooked yet given time. Do not punish – Punishing can have very negative effects. Sometimes they may lead to behavior being encouraged rather than discouraged because the child will get annoyed of the punishment so much so that he or she becomes adamant in carrying out the same behavior again. Talking about it – Talk to your child. Ask them what is bothering time if your child is in the talking age. Understand what is causing such behavior. Nail biting can be discouraged by making your children aware of the consequences of losing their nails or their shape etc. Hair biting can be discouraged by making the children feel disgusted with the stuff that is in the hair almost all the time. Biting on other children by toddlers can be discouraged by treating your child affectionately and politely requesting them to not commit the same mistake again. 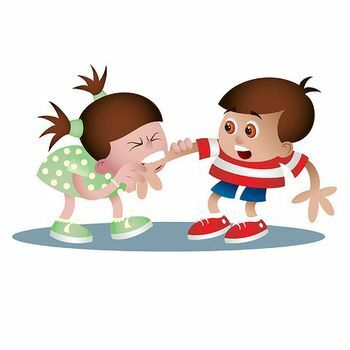 Notice when your child begins biting – Take note of the time and notice if there is any regularity in the time at which the child starts biting. Whether it is crying, yelling, arguing, anger, anything that may encourage the biting behavior all of a sudden, take note of it. Encourage children to talk to you- Rather than letting the child continue such habits, encourage them to come to you and talk about it. Comfort them and remind that you will be there to take care of them no matter what. Ignored and attention deprived children tend to engage in some annoying habits that could be hard to discourage once they catch a hang on to it. Therefore, it is important to never let them feel this way in the first place. Inform them about the public watching – Make them feel like the behavior they indulge in while biting will cause others to think badly or negatively about them. Make them think that this is the worst kind of embarrassment one can ever go through and that they will be avoided by people if they continue to perform such acts. Help them understand their emotions and how to tackle them – Everyone has their own way of dealing with different situations. Your child lacks the attention needed to understand his or her emotions and the ability to tackle them effectively which is why he or she continuously indulges in such kind of behavior. It is your job as parents to enable them to understand their emotions and react to them in an appropriate manner. Do not at all try to rush your child into therapy because this will only discourage him from being out in the open amongst people and may result in a very reserved type of character in the future. Children, when young, have the ability to learn social and personal skills more quickly. It is your job as parents to show them how to tackle every kind of emotion and situation in a positive manner.